Adjunct professor Walter Champion, left, Astros general counsel Giles Kibbe, Professor Tony Chase, Dean Leonard M. Baynes, Andrews Kurth Kenyon LLP partner Mark Arnold and Rice University professor Karen Jones, right, have their picture taken with the Commissioner's Trophy at a recent University of Houston Law Center CLE program. Dec. 20, 2017 — Six weeks after the Houston Astros won the World Series on Nov. 1, the afterglow continues to shine bright. The positive effects of Houston ending its championship drought in professional sports, among other sports-related topics, were discussed at a program titled, "Life after the World Series: Impacts on Houston and the Greater Community" recently at the University of Houston Law Center. "One of the great things about the Law Center and the University of Houston is we can bring great speakers in to discuss topical issues," Dean Leonard M. Baynes said in his welcoming remarks. "For many of us this year has been a year of ups and downs. We had Hurricane Harvey, which was a very difficult situation. Then we had the Astros winning a world championship which made everyone excited and put Houston on the map." The program began with a panel that included Mark Arnold, a partner at Andrews Kurth Kenyon LLP, Law Center Professor Tony Chase, and Giles Kibbe, general counsel of the Houston Astros. Chase led off with comments about Texas's ability to host major sporting events. "From an economic perspective, sports play a major role in our region," he said. "It's no mistake for example that there have been so many Final Fours in Texas over the last 10 years." Kibbe agreed with Chase and shared how the Astros' season meant much for Houston than just team pride. "Sports are extremely important to our city," Kibbe said. "The numbers that came in after the World Series showed that we had $95 million of economic impact from our playoffs. It was an average of about $6 to $8 million a game and the World Series was a little bit higher at $10 million. "The Super Bowl brought in $300 million. Ninety percent of the World Series attendance was Houstonians, and the Super Bowl was basically the opposite. Only about 10 percent of Houstonians were at the Super Bowl, and it was a lot of hotel and restaurant revenue." Arnold, who has represented the Harris County-Houston Sports Authority in connection with the development of Minute Maid Park, NRG Stadium, Toyota Center and BBVA Compass Stadium, reflected on the growth in the area that surrounds the Astros' home field. Back in 1997 there was an unused train station and a bunch of train tracks coming into Union Station. There is now significant development around Minute Maid Park like restaurants, apartments and high-rises going up. Some of that is a result of the Astros having 81 games plus other events. I think Jim Crane is doing a better job at promoting additional events at Minute Maid Park than the previous ownership did. For the second panel, Kibbe was joined by Walter Champion, an adjunct professor at the Law Center and the George Foreman Professor of Sports and Entertainment Law at Texas Southern University's Thurgood Marshall School of Law, and Karen Jones, a sports management professor at Rice University. A portion of the discussion centered on the rise of counterfeit merchandise that followed the Astros' championship win. "Not only does it have a great impact on business around the city, it also has a big impact on possible business for attorneys," Jones said. "Once you get all of this excitement around selling Astros paraphernalia, you also have an opportunity for lawsuits because a lot of people will start trying to misappropriate the team's logo." Kibbe pointed to a number of local businesses like 8th Wonder Brewery that make reference to the Astros' logo in their branding. He said the franchise is more concerned with people profiting on unsanctioned memorabilia. "I don't mind seeing businesses that have an Astros sign that they're not authorized to put up that congratulates us for winning the World Series," he said. "I think it's great for us and great for the city. I have a problem when people start selling unauthorized Astros merchandise. We have to stop that and protect our brand." 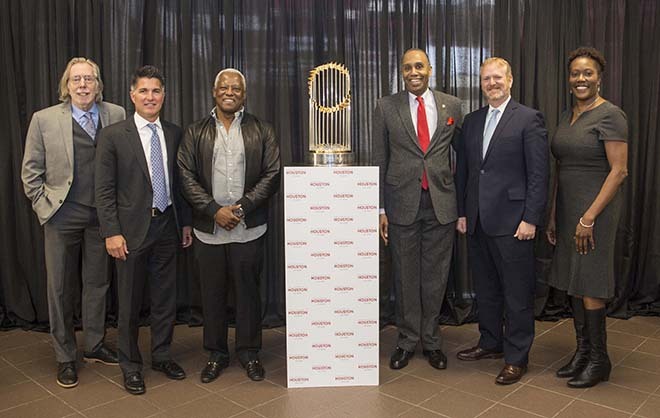 Participants had the opportunity to view and take pictures next to the MLB Commissioner's Trophy. Attorneys who attended received 2.5 hours in Texas continuing legal education credit, including a half hour of ethics credit.